In November 1621, after the Pilgrims’ first corn harvest proved successful, Governor William Bradford organized a celebratory feast and invited a group of the fledgling colony’s Native American allies, including the Wampanoag chief Massasoit. Now remembered as American’s “first Thanksgiving” - although the Pilgrims themselves may not have used the term at the time - the festival lasted for three days. While no record exists of the historic banquet’s exact menu, the Pilgrim chronicler Edward Winslow wrote in his journal that Governor Bradford sent four men on a “fowling” mission in preparation for the event, and that the Wampanoag guests arrived bearing five deer. Historians have suggested that many of the dishes were likely prepared using traditional Native American spices and cooking methods. Because the Pilgrims had no oven and the Mayflower’s sugar supply had dwindled by the fall of 1621, the meal did not feature pies, cakes or other desserts, which have become a hallmark of contemporary celebrations. In 1817, New York became the first of several states to officially adopt an annual Thanksgiving holiday; each celebrated it on a different day, however, and the American South remained largely unfamiliar with the tradition. In 1827, the noted magazine editor and prolific writer Sarah Josepha Hale - author, among countless other things, of the nursery rhyme “Mary Had a Little Lamb” - launched a campaign to establish Thanksgiving as a national holiday. For 36 years, she published numerous editorials and sent scores of letters to governors, senators, presidents and other politicians. Abraham Lincoln finally heeded her request in 1863, at the height of the Civil War, in a proclamation entreating all Americans to ask God to “commend to his tender care all those who have become widows, orphans, mourners or sufferers in the lamentable civil strife” and to “heal the wounds of the nation.” He scheduled Thanksgiving for the final Thursday in November, and it was celebrated on that day every year until 1939, when Franklin D. Roosevelt moved the holiday up a week in an attempt to spur retail sales during the Great Depression. Roosevelt’s plan, known derisively as Franksgiving, was met with passionate opposition, and in 1941 the president reluctantly signed a bill making Thanksgiving the fourth Thursday in November. In many American households, the Thanksgiving celebration has lost much of its original religious significance; instead, it now centers on cooking and sharing a bountiful meal with family and friends. Turkey, a Thanksgiving staple so ubiquitous it has become all but synonymous with the holiday, may or may not have been on offer when the Pilgrims hosted the inaugural feast in 1621. 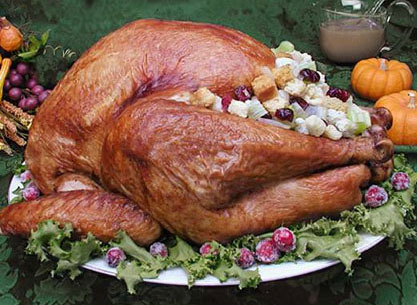 Today, however, nearly 90 percent of Americans eat the bird - whether roasted, baked or deep-fried - on Thanksgiving, according to the National Turkey Federation. Other traditional foods include stuffing, mashed potatoes, cranberry sauce and pumpkin pie. Volunteering is a common Thanksgiving Day activity, and communities often hold food drives and host free dinners for the less fortunate. For some scholars, the jury is still out on whether the feast at Plymouth really constituted the first Thanksgiving in the United States. Indeed, historians have recorded other ceremonies of thanks among European settlers in North America that predate the Pilgrims’ celebration. In 1565, for instance, the Spanish explorer Pedro Menéndez de Avilé invited members of the local Timucua tribe to a dinner in St. Augustine, Florida, after holding a mass to thank God for his crew’s safe arrival. On December 4, 1619, when 38 British settlers reached a site known as Berkeley Hundred on the banks of Virginia’s James River, they read a proclamation designating the date as “a day of thanksgiving to Almighty God." Although the American concept of Thanksgiving developed in the colonies of New England, its roots can be traced back to the other side of the Atlantic. Both the Separatists who came over on the Mayflower and the Puritans who arrived soon after brought with them a tradition of providential holidays - days of fasting during difficult or pivotal moments and days of feasting and celebration to thank God in times of plenty. Great history post, Christine! You know how much I love those. We're doing a little bit of history today, too, for our special sacramental review. Thanksgiving is catching up in Italy too, though Italians don-t know what it is about:) I celebrate it here in Rome but that-s because I lived in the States for almost 20 years and I appreciate its meaning and its food obvsiously! Love reading things like this! Christine! Köszönet ezért az alapos összefoglalóért, amit a hálaadási ünnepről írtál. És boldog Hálaadásnapi ünnepet kívánok! I agree, we've lost much of the meaning of Thanksgiving. Wishing you and yours a happy and meaningful one! Thanks for sharing this Christine! Happy Thanksgiving to you and your family!!! We don't celebrate Thanksgiving in this side of the world but just want to say Happy Thanksgiving , Christine ! Interesting post Christine, and Happy Thanksgiving! I didn't know that venison was served at the first Thanksgiving. I always learn something when I visit. 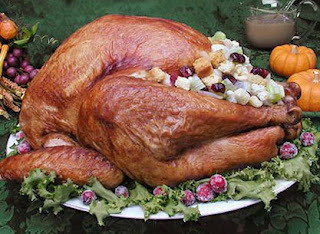 Very detail information on thanksgiving! I went to my 1st thanksgiving at my American friend last night, we had turkey, stuffing, mash potato, corn, beans and mushroom followed by pumpkin pie, it was a lovely big feast! Happy Thanksgiving to you! Sounds like a lovely feast. Happy Thanksgiving to you too!